Growth is increasingly elusive in today’s world, particularly from companies experiencing organic top-line revenue increases. There are very few companies that can grow revenues and earnings organically from operating purely in Australia as many of their products and services are saturated domestically. So where do we find companies that are benefiting from growth, scalability and distribution driven by local and global demand? In the case of the following 3 businesses, they are low in debt due to strong cash flows, have visionary management or founders and have strong appeal for their products. It also helps to have a growing middle class, a reform seeking government and an entrepreneurial and aspirant culture. One such company is India’s leading automobile manufacturer. Earnings growth has been compounding at over 35% per annum over the past 5 years. The company is virtually debt free due to strong cash flows and has an ROE over 20%. 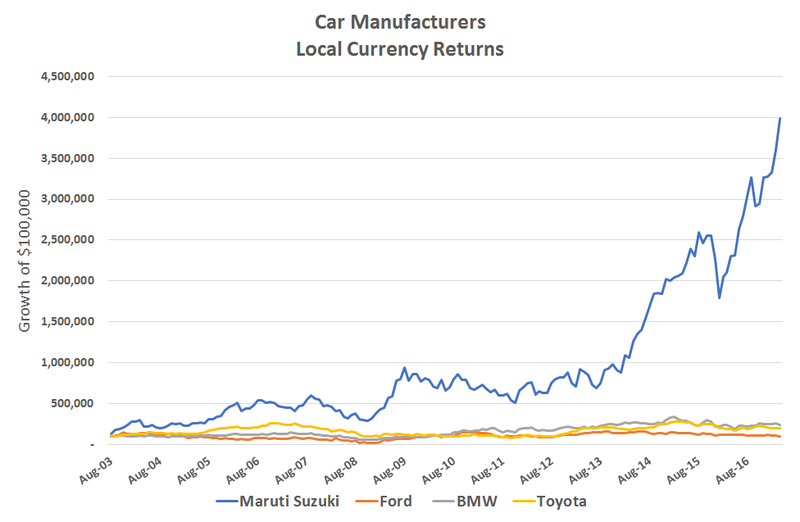 Companies involved in the “plain vanilla” business of selling cars are unlikely to have these metrics when selling to a developed market consumer. The name of the business is Maruti Suzuki and it is listed in India. The strong earnings growth comes from car ownership in India still being extremely low at 20 per 1000 people. This is forecast to grow to 175 per 1000 over the next 10 years. Maruti’s success has also come from brand recognition and an aspirational culture. As a business, it has significant repeat customers who swear by the brand. Maruti is a wonderful combination of Japanese precision and technology and India’s engineering nous and labour. This brings together a business which churns out one car every 12 seconds. It also has the widest network of coverage for service across India making it a strong offering for anyone considering a car purchase in India – of which there are many at present! We can extrapolate this to several other companies such as Sun Pharma, the world’s 4th largest specialty generic company, also domiciled in India. Sun Pharma has increased profits by over 18% per annum over the past 5 years and revenues by 28% per annum over the same time. Whilst some acquisitions along the way have led to margin dilution, the business has grown its global market share significantly in the US and Emerging Markets. In comparison to Maruti Suzuki, Sun Pharma has emerged from operations purely in India to be one of the most successful businesses in its craft globally. In fact, only 24% of its sales come from India today as the business has grown successfully by producing generics at an affordable price. The dynamics for this company have several tailwinds including increasing use of Healthcare as wealth increases in India, quality drugs at an affordable price and increasing capabilities in R&D. The firm highlights the entrepreneurial and management capabilities available in India to set up and build up a growing global business with over 34,000 employees, 2,000 products with a presence in over 150 countries. In this case, the closest comparison we have would be a company like CSL or Cochlear who have been very strong performers, driven by both local fundamentals and global growth. As you can see above, Sun Pharma’s share price has corrected over the last 2 years as it has absorbed a large acquisition in India. 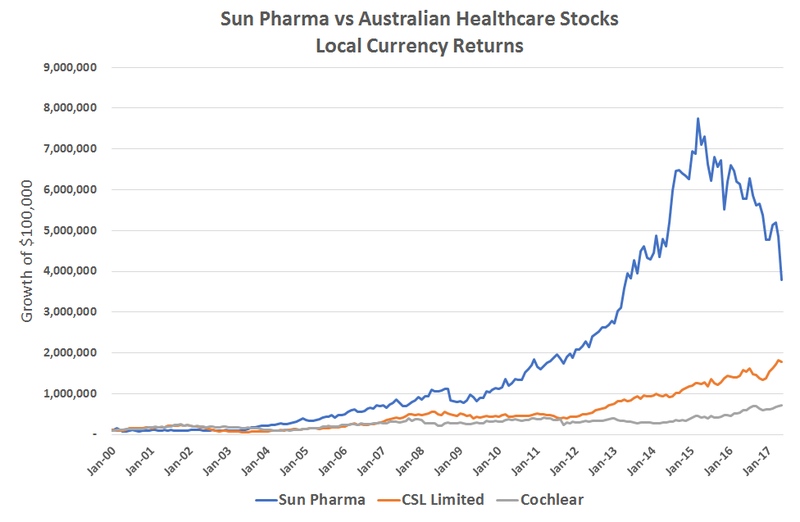 However, the returns from Sun Pharma over time has far outpaced both CSL and Cochlear; two of Australia’s best performed Healthcare stocks. Finally, we consider companies operating under the infrastructure thematic. In Australia, we have toll roads, ports, energy providers and airports to name a few infrastructure plays. However, these assets are generally operating assets which generate income for clients as a substantial component of their return. There are very few greenfield or brownfield developments which are listed. Larsen and Toubro (L&T) was established in India in the 1930’s and provides substantially exposure the infrastructure thematic of India. The company is a major technology, engineering, construction, manufacturing and financial services conglomerate, with global operations. L&T operates in eight countries outside of India and has grown its revenues by over 11% per annum over the past 5 years given increasing level of projects and general activity. The Modi Government recognises that infrastructure is a major bottleneck to growth and further foreign investment. Infrastructure is the pathway to greater equality amongst citizens. Again, the trajectory of forecasted growth for infrastructure companies in a region like India is very different to developed market exposure to infrastructure, which tend to be regulated, yield producing assets. Several companies like the ones outlined above are benefitting from India’s vibrant and youthful demographics. By 2026 it is expected that 547 million Indians will be classified as middle class (from 300 million today), with average real wages set to increase by 4x between now and 2030. This is creating a significant middle-class consumer set, which is highly aspirational and seeking alignment with their Western counterparts. However, the Indian consumer is highly value conscious and wants its products to have specific appeal to their needs. Corporates operating in the local ecosystem are best placed to benefit. To access India’s equity market, foreign investors must own what is called a Foreign Portfolio Investors’ License (FPI License). This allows investors to purchase on-shore securities which provide far more efficient and diverse exposure to the India growth story. These licenses have been difficult to get in the past and is almost impossible for retail or individual investors. Hence the best way to play the story is via an actively managed fund focused on India. This provides you with exposure to some of the best companies listed on India’s stock exchanges. Active management remains critical in a market like India as the dispersion between strong governance and weak is quite distinct. Additionally, stockbrokers tend to focus on only the top 150-200 out of the 5000 plus listed stocks creating significant mispriced opportunities. The India Avenue Equity Fund currently has over 10% exposure in the three stocks mentioned above in Maruti Suzuki, Sun Pharma and Larsen & Toubro, in addition to another 40 or so companies all experiencing the positive fundamental tailwinds as part of India’s ecosystem. Some great insights Mugunthan. Thank you.